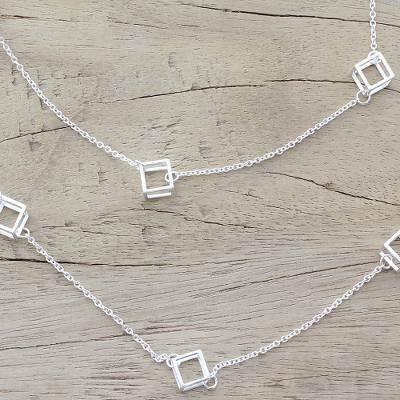 Long Sterling Silver Cube Station Necklace from India, "Silver Cubism"
Fascinating cubes come together between links of sterling silver chain to create this stunning long necklace. From Bhavesh, its hollow cubes create space and help add dimension and interesting texture when paired with any piece of clothing. This necklace embodies a beautiful yet understated glamour to help you shine in any outfit. It loops around the neck as desired. I really love the modern look of this necklace. The only issue I found is that I was no able to find the 925 mark, since it has no clasp. This necklace is beautiful and fun! It is actually little open boxes inbetween the chains. The delvery was smooth and I was apprised of its location all the way. Certainly a winner! I have never seen another necklace like it. It is well made. I love wearing it!